In the practice mode, you're asked to perform some moves. When the game shows the inputs to attack, you'll receive half points if you follow the inputs drawn graphically and full points if you invert the buttons. Start a game; in a few seconds you'll enter practice mode (don't press 1P button here or you'll skip it completely). 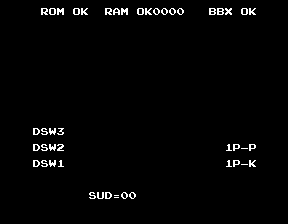 Assuming the drawn buttons are (from left to right) 1 and 2, I'm guessing they're either programmed wrong (original bug) or mapped inverted. No idea which is the case. Service Mode has punch button above kick button, therefore is definitely button 1.